Happy Monday, everyone! Oh how I love Monday. Am I the only one? I love that it's a fresh new start, that there's a whole week ahead where so many good things can happen. And I love that I can get back to work on my designs, too, which is exactly what I did today! I finally got my new pattern finished this morning. It's simple but elegant, and I thought it would be the perfect addition to anyone's Christmas decor (including mine). I hope you had a wonderful weekend and a great week ahead! 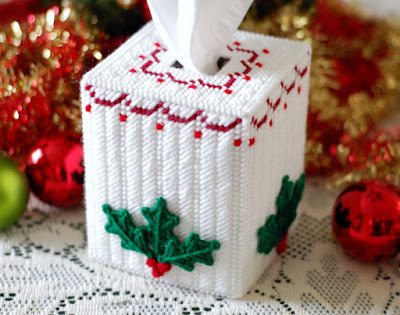 Oh what a lovely tissue box!